There are many HVAC multimeters available on the market, but only a few of them are worth checking out. Others are either too expensive or simply not worth buying. However, the main problem for most people is – how to differentiate the good ones from the bad ones. A lot of people buy a unit and figure out they’ve overpaid it. It usually happens when you buy a product with a ton of auxiliary features you’re never going to use. Even if you buy a top-quality multimeter, it won’t be useful if it’s too complicated to use, or it comes with a ton of features you didn’t want. However, you don’t have to worry about this, because we’re here to help you with the choice. We offer a deeper insight into the features and capabilities of various models. The one’s we’ve chosen to review are certainly worth checking out. Every single product we’ve reviewed offers a great price-to-quality ratio, versatility, and most importantly – ease of use. If you don’t like this particular model, go ahead and read our other reviews, you’ll certainly find something of interest. This multimeter is a great entry-level instrument for both professionals and beginners. If you’re an absolute beginner, you’ll find its design and ease of use handy. On the other hand, if you’re dealing with HVAC applications on a daily basis, its reliability and accuracy will impress you. It can measure frequency, capacitance, temperature, and much more. It is a manual ranging instrument, which means you won’t be able to set the range automatically. It’s not a big deal for devoted professionals; however, some beginners might find it confusing. Luckily, even if you never had the opportunity to use a multimeter, you’ll get a hold of this one within minutes. That said, even if you think you’re an expert, make sure that you read the user manual because not every unit is the same. This feature is great both for people who are planning to use this model daily, and others who need it for occasional tests. If you want to test for the presence of voltage, all you need to do is turn on the NVC mode and hover with the unit over the source you want to inspect. If there’s any voltage – the unit will alert you with an audible warning. While some consider this a standard feature in high-end multimeters, it’s still worth pointing it out because it has a lot of benefits. This unit does not have an auto-ranging function. Whether you’re an amateur or a professional – the lack of auto range can be a nuisance sometimes. While professionals know how to handle a manual ranging multimeter, the hobbyists may have an issue with it. However, it’s easily solvable. 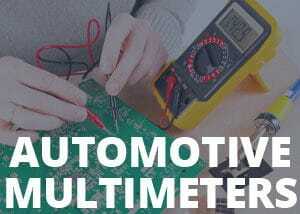 All you have to do is read the user manual and master the concepts of a multimeter. Once you get a hold of it, you won’t have an issue with manual ranging. The design of this product is quite peculiar. The standard ones are mainly designed ergonomically to ensure a better grip. However, this one is much narrower than the usual everyday multimeter, and it’s also a bit longer. It’s not hard to get used to this unusual design; you’ll get a hold of it within minutes. The benefits are pretty big. First of all, while it seems strange, it’s quite useful because you can use the tool single-handedly. It’s great for people who do multiple things at once. You can also buy an additional magnetic holster which allows you to put the multimeter on a metal surface and free both of your hands. Data hold feature allows you to store the last reading. If you don’t have a piece of paper to write down the values, or if they’re too complicated to memorize, all you have to do is press the “hold” button while conducting a test. The unit will hold onto the results until you overwrite them with a new reading, or you press the “hold” button once again. Although a lot of people consider the data hold function to be a standard, many multimeters lack this option, and it can be a nuisance sometimes. When it comes to saving battery – the Fieldpiece HS33 is among the best battery savers on the market. Many people simply forget to turn off their instrument after use, and it leads to unnecessary expenses. However, if your unit has the auto shut off feature; it will turn itself off after 15 minutes of inactivity and save battery life. It may seem underwhelming and irrelevant, but only until you end up with empty batteries. Once you get saved by the auto shut off feature, you’ll see how useful and respectable it is. One of the best things about this model is its versatility. In simpler words, it can be used both by amateurs and professionals. However, if you’re a beginner, you might want to find something with less additional features, because you probably won’t need most of the features of the Fieldpiece HS33. On the other hand, if you’re an electrician who handles HVAC units daily, this multimeter might be the thing you’re looking for. It offers a ton of auxiliary features, ease of use, and accuracy. One of the critical factors that make or break a multimeter is its accuracy. Luckily, this one has a pretty good range, accuracy, and resolution. Although it’s a great multimeter for most electricians, it comes with a few downsides. While they are minor, it’s still worth pointing them out so that you get familiar with the shortcomings before you decide whether you’re going to purchase it. The first thing you’ll notice is the lack of display backlight. It’s a huge downside for people who work in dark places. The manufacturer justifies the lack of the backlight with the impressive quality of the display. While it’s completely true, the display is indeed quite good; it’s still without a backlight. If you’re planning to work in dark areas, consider purchasing another model. The lack of auto-ranging can be considered as a downside by some users. Although it doesn’t affect the quality, precision, or resolution of the multimeter, the beginners sometimes find the use of manual ranging confusing. Luckily, the problem is easily solvable. All you have to do is check out the user manual and get familiar with the concept of manual ranging. Once you master it, using the Fieldpiece HS33 will be a piece of cake. Does the display have a backlight? No, this unit is not backlit. Is it hard to use this multimeter? Not at all. In fact, it’s pretty simple. As long as you read the manual and follow the usual rules, you won’t have an issue with the Fieldpiece HS33. Can I measure temperature with it? Yes, you can. The unit comes with a thermocouple included which can measure the temperature of various objects and liquids. However, don’t dip it in corrosive liquids or else you’ll break the probe. Is it an expensive instrument? It depends on your definition of expensive. While it has a somewhat premium price, it’s certainly worth every dollar. Many more expensive multimeters have the same exact features as this one. You’ll get the Fieldpiece HS33 multimeter, a pair of test leads, and the thermocouple. The magnetic holster and clamps are considered to be additional accessories. Most people who bought or tested this unit have a positive impression. Although the lack of the backlight is a pretty big disadvantage, everything else is easily solvable. The design is good, and most importantly – the unit is easy to use. If you’re a beginner, you’ll like its versatility and simplicity, whereas if you’re a professional, you’ll like its precision and accuracy. The users who bought this unit via Amazon gave it a 4.7-star rating, which is quite impressive. The Fieldpiece HS33 won’t let you down in tight situations. If you’re dealing with HVAC applications on a daily basis, this might be the perfect product for you. It’s lightweight, compact, and affordable. Those are the three crucial factors of every multimeter that’s worth checking out and purchasing. Although it has a few shortcomings, most of them are not a big deal. If you want to explore more and revise some other options, don’t hesitate to read our other reviews, there might be something suitable for you there.